Serving up holiday appetizers don't have to be a huge ordeal. Your finger foods don't have to be some grand presentation, in fact, sometimes keeping them simple and even teeny tiny can make them more appealing. Especially during these hot summer months, the last thing you want to do is create heavy, filling and dense foods to feed to your guests. There's nothing wrong with using fewer ingredients and keeping it simple, however, that doesn't mean they still can't look inviting. 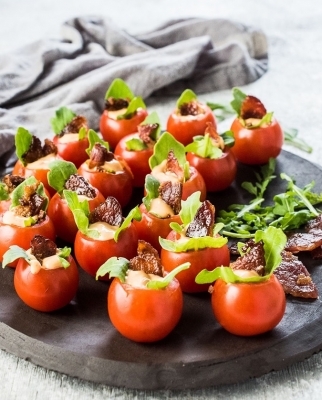 We found these adorable and delicious Bite-Size Mini BLT Cups and they are sure to be a perfect fit to serve this summer, or anytime for that matter. Click below to see the recipe and enjoy these poolside this weekend.